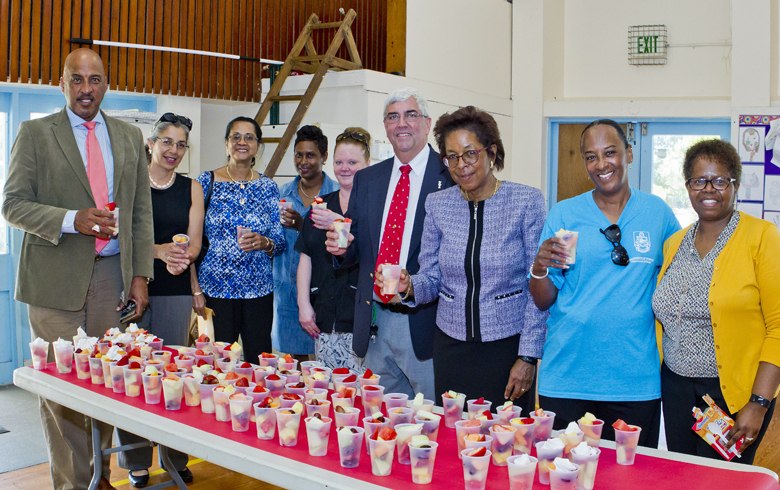 On Friday, the Minister of Health and Seniors Jeanne Atherden and the Minister of Education Cole Simons joined members of the Paget Parish Council at Gilbert Institute in support of a collaborative community wellness initiative. Proposed initially by the Department of Health, the Paget Parish Council is promoting healthy eating and active living in Paget. L-R Minister Cole Simons, Ms. Virginia DeSilva of Paget Parish Council, Mrs. Olga Scott of Paget Parish Council , Mrs. Ronette Burgess of Marketplace, Ms. Karen Higgins of Marketplace, Bill Pitman, Chair of Paget Parish Council, Minister Jeanne Atherden, Marie Beach, Department of Health, Mrs. Coraleta Dill, Principal, Gilbert Institute. “A highlight is a wellness program called “Fresh Fruit Friday”. Fresh fruit platters are donated by the Council and delivered by Paget businesses, A1 and The Modern Mart of The MarketPlace Limited, to three primary schools in Paget with the aim of encouraging healthy eating among the students. 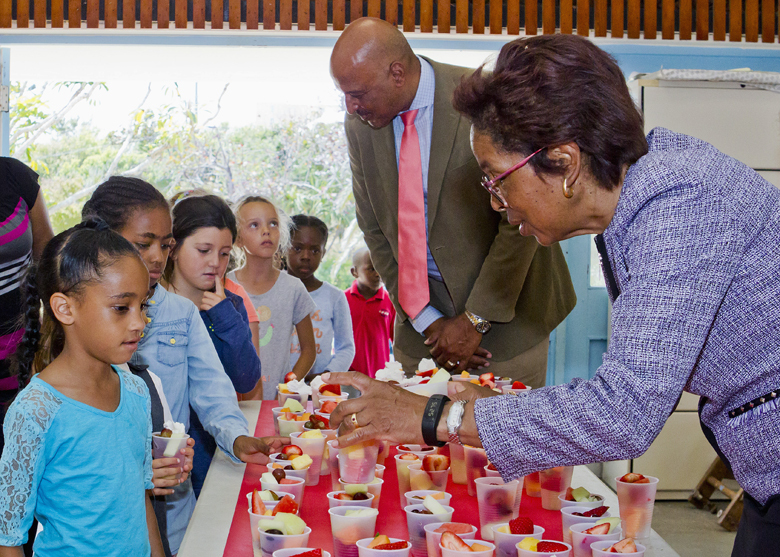 “The initiative began on Friday, 25 November, 2016 at the Gilbert Institute, Paget Primary and St. Paul’s Pre-school resulting in approximately 325 students enjoying the fresh fruit delivered to their school once per month. 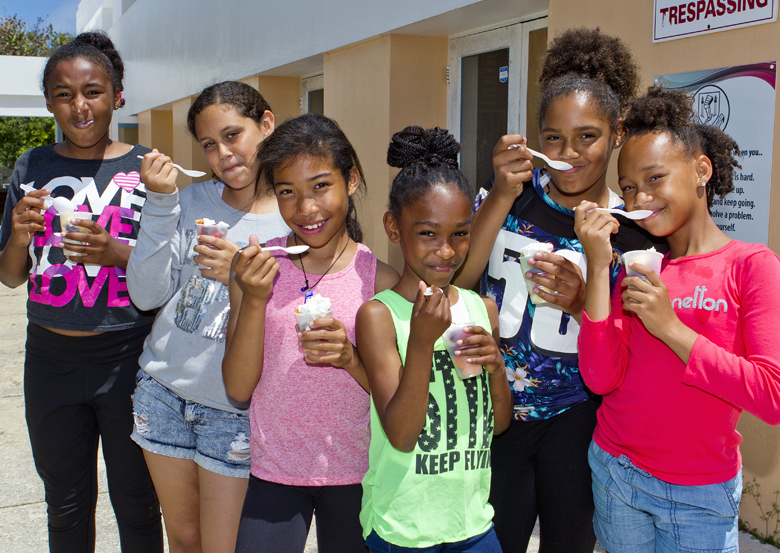 The children love the fruit and the teachers are excited that children are being encouraged to eat healthy food.